Another year is going by, who likes getting older? I don’t and people who say they do, I am not sure they really mean it…yesterday was my birthday and I got up with a massive headache! So I still decided to treat myself thinking that one of those mini desserts, will make me feel better. When and if you make pain d’épices, you open the door to many preparations. I could not resist to make those mini desserts after I made pain d’épices. They’re not sweet, but very light and terribly delicious. Of course, they’re tiny so you can easily eat a few. 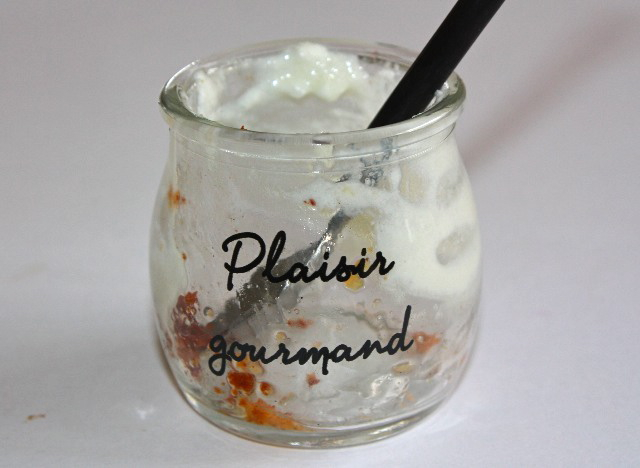 That glass is actually about 2 inches tall, or a bit smaller, so with a few spoonful, you can finish it up. Mini desserts are great for parties, you eat one and it’s not stuffy, no one likes the feeling of being stuffed (I don’t), the feeling of being satisfied is much more pleasant in my opinion. The mousse is so light and the fruity compote combined with spicy cake makes it the perfect trio. Separate yolk from white and place in different containers. Add sugar to the yolks and beat until the mixture turns white and creamy and doubles volume. Beat the whites in a stiff consistency. Carefully add the whites to the yolk/fromage blanc mixture. Cook peaches with sugar and vanilla for about 15 min or until they turn soft and mushy. Let it cool down. 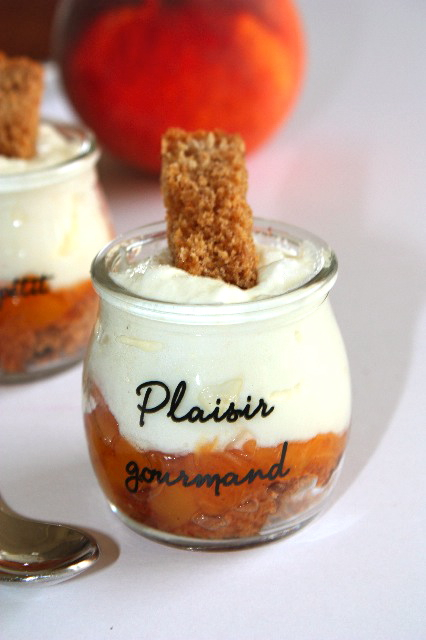 In a small glass, place one tbs or tsp (depending on the size of the glass) of crumbled pain d’épices, add 1 tps or tsp of peach compote, then add fromage blanc mousse. Repeat process twice until you reach top of the glass. Eat at room temperature or cold. 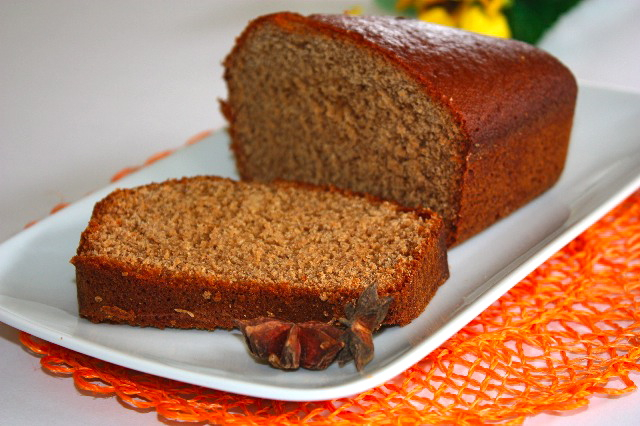 This entry was posted by silvia on October 15, 2011 at 1:26 am, and is filed under Desserts. Follow any responses to this post through RSS 2.0.You can leave a response or trackback from your own site. Happy Birthday, so sorry about your headache. The mini desserts are just darling. J’adore le pain d’épices et je dois dire qu’à ce temps-ci de l’année, il me satisfait vraiment beaucoup. J’aime vraiment beaucoup tes verrines, elles sont vraiment superbes et les différentes saveurs doivent se marier à merveille! Je suis rude moi… Bon anniversaire Silvia. Moi non plus je n’aime pas prendre de l’âge…. Happy Birthday! Thank you for making me drool! I’m sorry I haven’t been visiting…this arm is taking its time to heal! But it is ALWAYS a joy to spend time perusing your lovely site. Many blessings! Happy Birthday! What beautiful presentation for these lovely little treats! 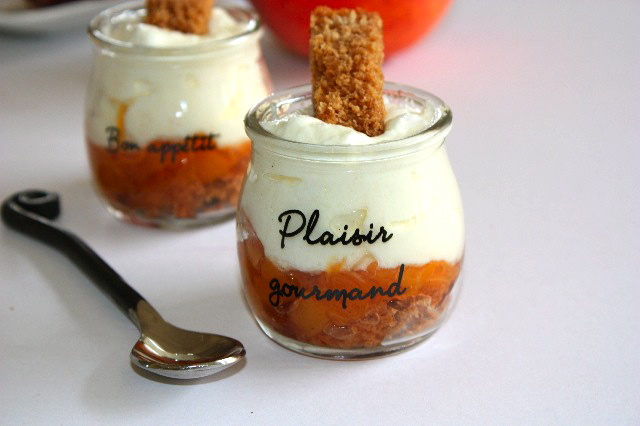 Oh Wow, peaches and Greek yogurt make me want to eat this now. Great idea on combining the two. Happy Birthday!